Archaeological sites underwater and on the foreshore are of many different types, sizes and dates, some will be more intact than others, some will be in difficult places to work or where available time on site is very limited. These are just some of the factors to consider when choosing how to record a site. One of the first choices to make is what level of accuracy will be required as creating a record that is accurate to 25mm (1in.) is much more expensive than a plan accurate to 300mm (1ft.). The accuracy is a measure of how well you know the position of one object relative to another and here it defines how well the plan represents the real site. Associated with this is deciding what level of detail, or how small a feature is to be recorded, as recording every feature bigger than 25mm will take longer than recording every feature bigger than 300mm. Assessment surveys are often recorded with low level of detail and a lower accuracy so the record can be completed quickly and simply. Recording surveys should be done with a high accuracy and a high level of detail so lots of good quality information is captured. It is possible to record a site with low accuracy but high level of detail but this would produce a detailed plan that was not a good representation of the site. Some knowledge is required of the accuracy achieved by different survey methods so the correct method can be chosen for the task to be done and this is discussed below. The next question is 'what do we need to record?'. Are you doing a quick assessment of a site where simple recording methods are enough to get the job done, or are you recording during an excavation where the site will be removed as the excavation progresses? Recording during excavation or in advance of any development work requires the highest levels of accuracy and detail as the site cannot be recorded again if mistakes are made and what has been recorded will be the only record of the site. The methods that can be used on a site vary with the type of site and its environment. A high precision GPS or a total station can be used for positioning on a dry foreshore site but not on a site that is underwater. Some photographic recording methods can be used underwater where the visibility is good but not where it is poor. 3D trilateration takes time to set up so it is a method more suited to foreshore and shallow water sites where plenty of time on site is available. Some methods can only be used if particular expertise or equipment is available. 3D Photogrammetry is an excellent way of recording many sites and provides both a high accuracy and a high level of detail, but this requires access to expensive processing software and the expert ese to process the images. Some underwater acoustic positioning systems can provide positions better than can be achieved using tape measures, can be used in any depth of water and in zero visibility but are expensive to rent and require a subsea surveyor to operate them. The decisions made at the start of the project can be added to the project design or project plan. The plan should specify the accuracy required and the level of detail, from these numbers the methods to be used to achieve them can be decided. Small iron or steel shipwrecks or aircraft are often the easiest to survey and record, particularly if they are on the foreshore. For a quick assessment of a small site in good visibility a sketch may be all that is needed. Being small they can be surveyed with simple methods and if they are flattened the two-dimensional methods such as offsets and ties can be used. The radial survey method does not work well as it requires angle measurements from a magnetic compass which will be affected by the iron wreck structure. A photomosaic can be created from overlapping photographs pointing straight down on the seabed, this works for flattened sites but not so well for sites that are taller or more intact. A more intact iron ship may need different recording methods to capture the height information. Two-dimensional survey methods may not work well because of the height of some of the structure so 3D trilateration is the remaining cheap and simple option. For those with the skills and the equipment the 3D photogrammetry method can provide very accurate results with a good level of detail. If the name of the ship is known then it may be possible to find the original builder's plans. The plans can then be digitised and used as a framework for the survey if the ship is still in one piece. If the ship is broken into pieces then the plans may help in the identification of which piece is which. 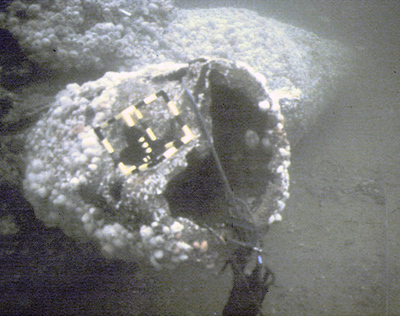 If the wreck is broken into pieces then the survey and recording can be done in two stages. Firstly, add Detail survey points to each section of structure and position them. Secondly, record each structure individually then put the pieces together on the site plan using the Detail points to align each separate structure drawing. The positioning method chosen depends on the usual factors of accuracy required, size of site and time available. 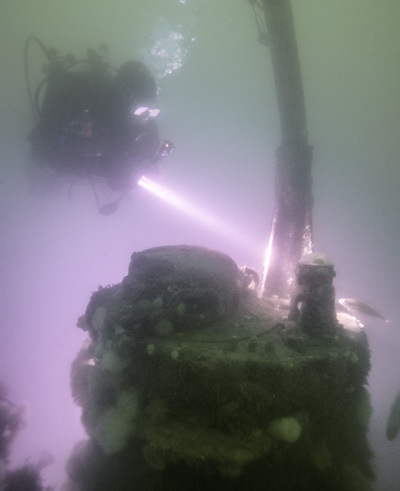 If the pieces of the wreck are widely scattered and a low accuracy is sufficient the then each structure can be positioned using a GPS position fix. If the pieces are close enough together then a tape baseline can be laid through the site and the pieces positioned using offset and ties measurements. If high accuracy is required then 3D trilateration can be used on sites smaller than 50-60m long. This works well for sites underwater and on the foreshore. For those with the skills and the equipment the 3D photogrammetry method can provide very accurate results with a good level of detail. To achieve high positioning accuracy on a large site then the use of an acoustic positioning system can be considered. 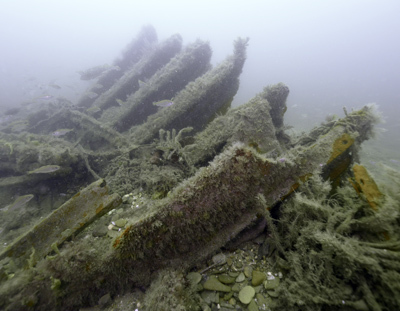 Large iron shipwrecks are difficult and expensive to record using simple survey techniques. More often just the diagnostic parts of the ship are recorded either to help identify the ship or as a record of its current condition; the most diagnostic parts are the bow and the stern. For an intact vessel the centre portion of the ship can be recorded as a simple cross section as one part of the hull can often be very much like another. For a flattened site where the boilers and engine are accessible then these should be recorded as their dimensions can be used to help identification. For early steamships the engine may be the only surviving example of that type so your record may be the only record of that particular engine. For those with the skills and the equipment the 3D photogrammetry method can provide very accurate results with a good level of detail. To achieve high positioning accuracy on a large site then the use of an acoustic positioning system can be considered. Excellent 3D records of this type of ship can be obtained using high frequency multibeam sonar, the records are very detailed and very accurate and can be used as a framework for more detailed recording. An iron or steel shipwreck scattered over a wide area can usually be treated as lots of small sites and recorded in sections one at a time. If the wreck is very scattered then identification of pieces can be difficult but plotting the locations can help as usually pieces found near each other on the seabed were near each other on the ship. if the site has been dispersed by explosives this may not be the case and pieces will be found scattered all over the site. With a large area to cover the separate pieces can be positioned using a GPS surface fix. For pieces closer than 30m apart the accuracy can be improved by adding a simple distance measurement between the pieces to the plan. Again the most diagnostic pieces should be recorded in detail such as bow, stern, engine and boilers. Where available a side scan sonar image of the site will help with positioning and locating parts of the ship so long as the wreck is on a flat seabed, if its on a rocky reef a side scan is often of little use. High quality multibeam sonar can be used on any type of seabed; on sand the parts of the wreck can be identified and positioned while on reef any gullys or features can be used as a framework for positioning the individual wreck pieces. 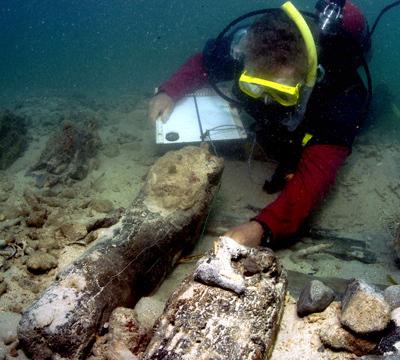 Older, wooden vessels lying exposed on the seabed may decay to such an extent that the timber of the ship disappears completely leaving just the metal fittings and more resilient objects such as pottery. The remains of these ships can be found as scatters of objects and some of the more easily located are ships carrying iron guns as they can be detected remotely using a towed magnetometer. 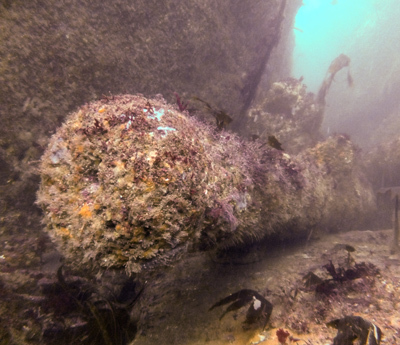 These sites are often found on a rocky seabed with larger objects such as cannons, anchors, cannonballs and iron ballast blocks visible on the site with smaller items like pottery fragments and musket balls trapped in gullys or pockets in the rock. For a quick assessment of a small site in good visibility a sketch may be all that is needed. Laying a tape measure baseline through the site helps with producing the sketch especially if the visibility is poor. For more accuracy the objects on the site can be positioned using offset and ties measurements. For larger sites the errors in the 2D survey methods are too large and 3D trilateration is required to ensure the site plan is accurate. Really scattered sites can be recorded using the methods described for the scattered iron shipwreck above. This type of site be recorded using the methods described above for a scattered iron shipwreck. Wooden ships can show a wide variation in how they were designed and constructed, more so than for iron ships. 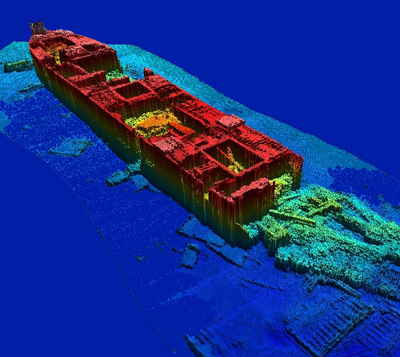 An assessment survey on this type of vessel can be undertaken using the same methods on a similar sized iron ship as this level of recording is only designed to establish what is on the site. 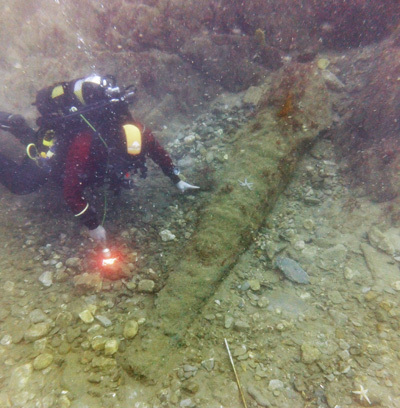 But a recording survey also needs to include a detailed record of how the timbers of the ship were put together. Wooden vessels in some parts of the world like the UK will erode very quickly while in other areas such as the Baltic they remain largely unchanged for many years. A vessel that has recently appeared from the seabed may degrade very fast so if recording work is to be done on the site it is important to do it quickly before surface details erode, stucture collapses or loose objects wash away. For iron ships the rate of change is often considerably slower so there is less of a need to record the ship quickly. A recording strategy needs to take environmental conditions in to account when planning fieldwork. 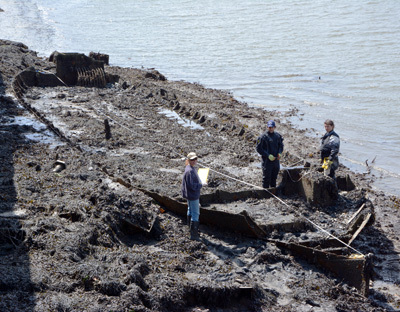 Piles of ballast on a sand or mud seabed may be protecting the remains of wooden ship structure underneath. 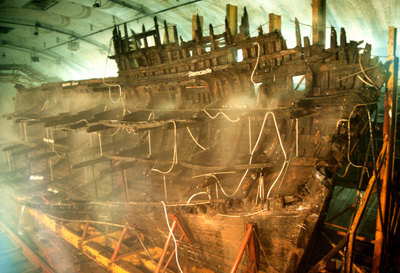 The most difficult sites to record accurately are large wooden ships. The sheer size of the site makes survey operations difficult and provides lots that must be recorded, but if the ship is also old or unusual then the smallest details need to be recorded at the highest accuracy. Unfortunately these sites are often found in deep water as the conditions are such that they get preserved so the problems of working at depth then become a major factor, see below. This type of site can also be found buried in soft sand or mud sediments where the seabed has preserved the timber, but the same seabed then can often make visibility on site very poor which makes recording harder to do well. Any site that may be unusual or even unique brings an additional problem in that there may only be one chance to record a vessel like this. An assessment survey of an unusual site could be repeated if the site is stable but sometimes a site becomes uncovered from the seabed and erodes within months. The excavation of a unique site will destroy the site itself so the record of it must be accurate and complete. Any record of a site that has been destroyed by erosion or excavation then becomes the only record of it so the recording must be done carefully and completely. The project plan should include an investigation into the stability of a site to determine if further work could be done on the site before it degrades too far. The highest quality survey and recording methods should be used on unusual sites and it is essential on vulnerable sites or during an excavation. If the water depth is shallow then 3D trilateration should be used to obtain the highest survey accuracy, backed up with 3D photogrammetry to record structure along with detailed records of particular features. In deeper water where time is short the 3D trilateration can be replaced with high precision acoustic positioning as it is more efficient. If the skills, equipment or funding are not available to record the site properly then the site should be reburied until a proper record can be made. A shipwreck scattered across a rocky seabed cut with deep gullys is an interesting one to survey and record. The artefacts and structure from the ship usually fall to the bottom of the gullys so there is often no clear line of sight from one gully to another making positioning difficult. One way to record this type of site using basic methods is to treat each gully as an individual site then tie them together on the site plan using GPS surface position fixes taken at the two ends of a gully. High quality multibeam sonar can be used to map the gullys and the resulting sonar map of the seabed can be used as a framework to position objects in the gullys that it shows. Any site in the 30m-40m depth range allows a limited time on site when using conventional open circuit SCUBA equipment. The effect of narcosis is also one that is underestimated and will have a detrimental effect on the speed and quality of any recording work. With limited time any manual methods chosen for recording should be quick, efficient and simple. 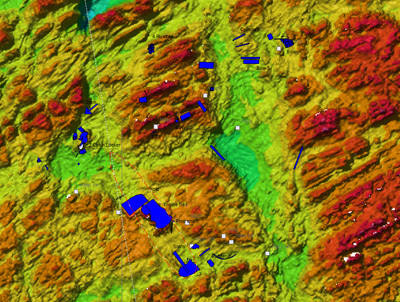 There may not be sufficient time available to accurately record large sites at this depth so methods may be limited to sketching, simple measurements, photography and video. Time on site can be increased by by using closed circuit rebreathers. One option is to train the existing dive team and purchasing the rebreathers and the other is to train rebreather divers to do the recording. One problem is that training the existing team is expensive as is the equipment and not everyone is keen to dive on a rebreather. The other option can also be flawed as not every rebreather diver can be trained to do accurate recording work underwater. If the conditions are suitable and the resources available then the video could be used to create a 3D model using photogrammetry, this method is becoming more common and may soon be more readily available. High resolution multibeam sonar is very useful under these conditions and on some sites side scan sonar imagery is also useful. Working effectively beyond 40m is difficult because of the limited time available on site and the effects of narcosis. Rebreathers and more exotic breathing mixtures will extend the range at which any work can be done but as mentioned above it can often be difficult to find people who can dive safely at depth and still do useful work. Where finances permit the use of a Remotely Operated Vehicle can greatly extend the depth that can be explored and extend the time that is spent there. 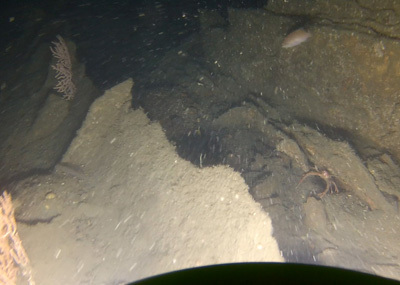 However, small ROVs can do very little other than record on video the view from their camera and being unstable the view is often rapidly moving and jerky so it can be hard to work out what you are looking at. The tether connecting the ROV to the surface seems to be deliberately designed to snag on any part of a shipwreck being investigated so there is a high likelihood that the ROV gets trapped in the site being recorded. A backwards facing video camera is a great help when operating near a wreck as this allows the ROV to be reversed safely and can be useful for keeping an eye on where the tether is. Larger ROVs are more useful as they can carry more and better cameras as well as a subsea positioning system. Being bigger the images from the camera are more stable and are of more use for helping create a site plan. A bigger ROV is more expensive, requires a bigger boat to deploy it and a bigger team to manage it.